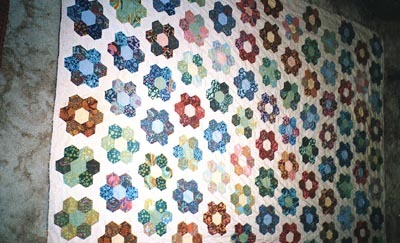 This is one of two single bed quilts in a pattern the owner calls 'Martha Washington's Flower Garden'. Flowers are in six hexagons in a variety of prints with a plain coloured centre. The background is cream, and the backing is calico. 2500 x 1800 mm. This quilt was made by Pearl Holland in approximately 1956 in Castlemaine, Victoria. 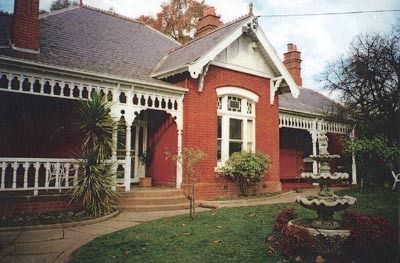 It is still owned by Pearl Holland, and is used in the family holiday unit in Hervey Bay, Queensland. "The name (Martha Washington's Flower Garden) was given to Pearl by Mrs Brent Clarke who was President of Quilters Association in Melbourne at one stage. In the 1920's, Pearl had seen her mother's friend working on a quilt with this pattern, so these quilts are from her own memory of what she saw then. 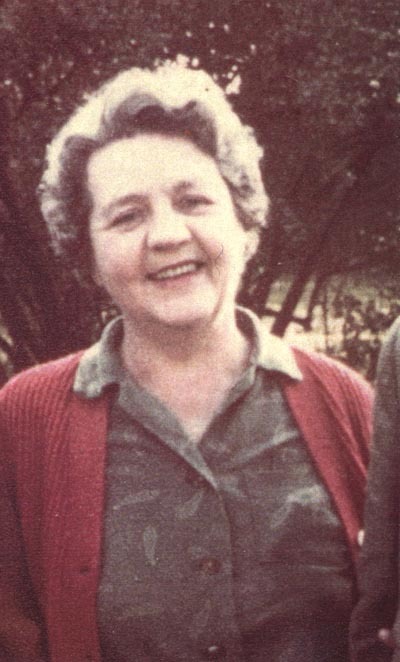 She used sample materials from Sekers Wholesalers in Melbourne who gave her the pieces still in their bundles after she was introduced with a letter from a local Castlemaine draper (Max Rigg)." Patchwork quilt of cotton hexagons in a random mix of colours and prints, the predominant colours being blue, red, green, light yellow and pastels. Patches hand sewn. There is no padding and the backing is a grey wool blanket. The top is machine stitched around the edge to the blanket. Pieced hexagons, English paper method. Large hexagons form the centre with a border of smaller hexagons. The fabrics are all cotton in a wide range of colours and patterns. There is no padding. The backing is cotton, large white floral design on dark blue. The hexagons are hand pieced and the edges machined. Frame quilt, hand and machine sewn, centre square of squares (7 rows by 7 rows) of 2 triangles, with red border. Alternate rows of triangles, rectangles, 'flying geese' border, squares, squares set on point with triangles, wide red border. Hand quilted throughout in chevrons, single cables and single scallops. The padding is a hand woven cream wool blanket and the backing is cream cotton twill. Crazy patchwork cot quilt made from a wide variety of materials, patterned and plain. Some seams are overstitched with feather stitch and herringbone. One of a pair. There is no padding. The backing is taffeta.